Every April, when the last game of March Madness is over, but before One Shining Moment plays to commemorate the end of the NCAA tournament, a completely normal but absolutely strange tradition plays out: Players and coaches from the championship-winning school climb a ladder, scissors in hand, and cut off parts of the net from the hoop used in the game. The tradition isn’t just for the national championship game of the NCAA tournament. Win your conference tournament? Cut down a net. Win your region and advance to the Final Four? Cut down a net. If there’s a trophy to be had, there’s a net to be cut. So, how exactly did this tradition start? Whereas the use of March Madness can be traced to Illinois high school basketball, cutting down nets likely finds its origin in Indiana high school basketball. RELATED: When did NCAA tournament brackets become popular? Everett Case spent 23 years as a high school basketball head coach in his home state of Indiana, where his team won four state championships. In 1946, Case became the coach at North Carolina State, and when the Wolfpack won the Southern Conference tournament in 1947, Case climbed atop his players’ shoulders and cut part of the net to have as a souvenir. NC State Athletics Everett Case cuts down the net after his NC State team won the Southern Conference championship in 1947, starting a tradition in college basketball. 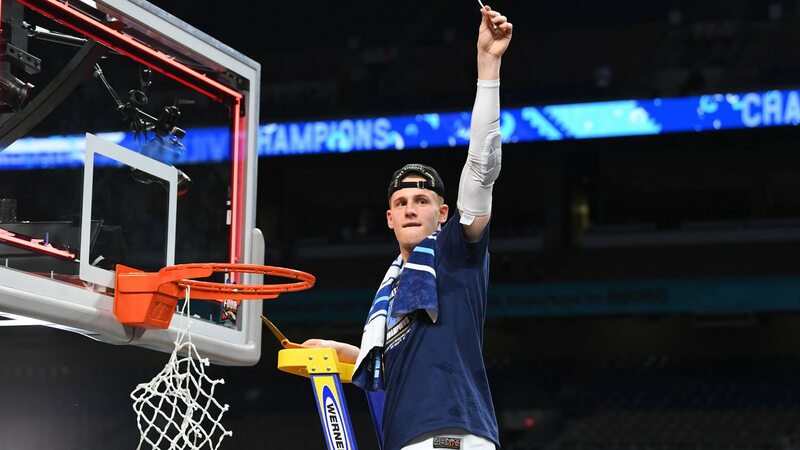 This moment is unchallenged as the origin of the tradition at the NCAA level, but there is some dispute as to whether Case cut his first net with NC State, or whether he brought the ritual from his time in Indiana. Either way, the practice has become ingrained in college basketball since. It's spread to the women's college basketball tournament and to high school basketball programs across the country. At the end of a season, one team will be snipping some nylon. It's gotten so big that the NCAA championship now has an official ladder (Werner) and scissors (Fiskars). Of course, mixing ladders, scissors, and adrenaline have resulted in a few minor injuries to players and coaches, but the tradition lives on. Cutting down the nets wasn't the only tradition Case brought to NC State. The coach instituted a pep band, noise meter, and spotlight for introducing players, all while leading NC State to a 377-134 record. The head coach was inducted into the College Basketball Hall of Fame in 2006.